Why should I buy a LED neon light sign from Custom Neon? Cheap - We will beat any like for like quote for a customized sign by 10%. Easy to Install – All of our Custom Neon™ lights come with pre-drilled holes for easy hanging & wall mounting. Low Maintenance - Our Custom Neon™ signs are very hardwearing and easy to clean. What is a Custom Neon™ sign made from? Our neon lights, signs, art and lamps are made from high quality LED flex making them different from traditional glass neon. Cased in flex rubber tubing. LED flex neon products are more cost-effective, durable, energy efficient, and safer than glass neon products, while providing an incredible visual impact that is on par with, or even greater than, you get with a traditional glass neon sign. Available in a wide range of colors and styles. Available in a variety of on-trend quotes and aesthetic designs in our Store. Available as a personalized neon sign. Available in your own design using our Custom Neon™ sign maker. encased in clear acrylic boxes. Less than you might think! Our handmade neon LED signs, lamps and wall décor are affordable and we are very competitive on price! So competitive in fact that we will beat any like for like quote for a customized sign by 10%. Why are Custom Neon™ signs cheaper than its competitors? With our signs you will receive the highest quality product on the market, nevertheless you’ll notice our prices are much better than our competitors. If you’re wondering why, the short answer is we don’t mark up our prices as much as other suppliers. This means we can provide more signs at a better price for you. Why are Custom Neon™ signs safer? Custom Neon™ signs are made with LED flex. There is no glass in our neon signs. The LED lighting will not overheat and make the signs much more energy efficient than traditional glass neon signs. This is great for the budget and even greater for the planet. Custom Neon™ signs made from LED flex are more durable, easier to transport and are surprisingly light weight. All of our LED flex neon signs have UL certification. What’s the difference between traditional glass neon and LED neon? The lower voltage means LED neon signs don’t get hot and there’s no glass to break. Not usually considered suitable for homes with children due to the safety risks from breakages. No special installation team needed, just hang as you would any other piece of wall art. The weight, fragility and power requirements of traditional glass neon signs usually require specialist installation. 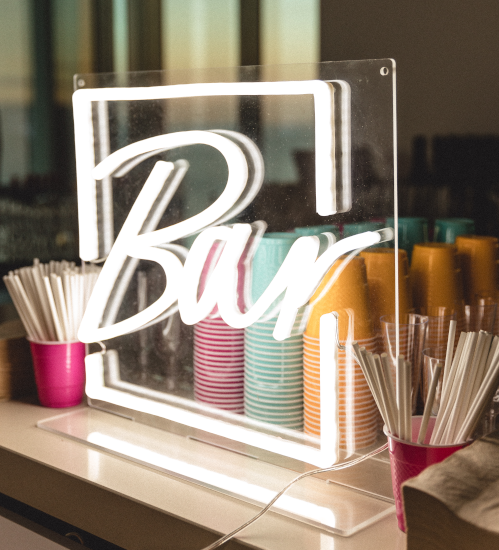 LED flex is considerably lighter than glass making neon LED signs lightweight enough to use just about anywhere including as bedroom décor, portable party décor, for events, and much more. The glass tubes used in traditional neon is heavy, making glass neon signs more suitable for outdoor installations in static positions. LED flex neon signs will not cause interference with your TV, Wifi, etc.. The vintage neon look can be recreated in neon LED but it won’t be exactly the same. Some people just need the nostalgic look of old-style vintage neon and that’s ok! How are Custom Neon™ light signs made? Custom Neon™ signs are handmade to your approved design using LED flex on an acrylic backing. The materials used are PVC and acrylic. There is no fragile glass that can break, no neon gas, and no mercury. What is the LED neon flex tube attached to? Our signs come with an acrylic backboard. You can choose a few options when it comes to this backboard (sometimes the design will determine what backboard is required). The backboard can be cut around the shape so it is contoured and nearly invisible or it can be cut in a desired shape. What font can I choose? Great news, we can work with any font. If your preferred font isn’t listed on our custom neon sign maker just contact us with your preferred font and we will make it happen for you! Our custom sign maker is perfect for creating neon word signs, personalized name signs and neon light quotes. If you are looking for something different, such as a business logo sign, customized open sign, or unique neon artwork, we would love to work with you on a design. We can do almost any font, shape, style and design - turn your vision into a neon masterpiece! Contact us with your ideas now. Are your signs battery operated or do they plug in? Custom Neon’s full range of neon signs, lights, lamps and wall art plug into a power socket. We only offer batter pack options for very small signs and lamps. Most Custom Neon™ products come with a 4.9ft transparent cord which plugs into a US certified AC adapter. The adapter has an additional 3-6ft of black cable that plugs into the socket. A dimmer and remote control can also be purchased at checkout. How do I hang / wall mount my neon light? 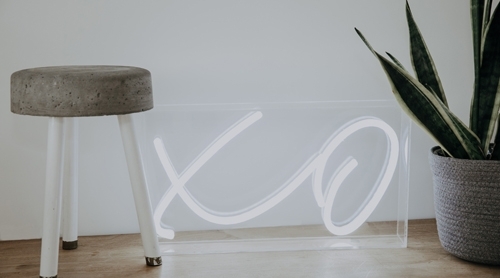 Hanging your new neon light sign is surprisingly easy. Custom Neon™ signs weigh 6-11lb on average and include pre-drilled holes on the acrylic backboard. On average, most signs weigh approximately 6-11lb. Custom Neon™ signs are safe to transport and easy to install. Note: The above is a recommendation only. Custom Neon is not responsible for the wall mounting and/or installation of any of our products. Can I get a LED neon light that will stand up without needing to be wall mounted? Neon lights, lamps and sculptures with an acrylic base to allow for stand-up signs. Custom Neon™ signs are mounted on an acrylic backboard. Our team will select the best backboard option based on the design you’ve chosen. Please let us know if you have a preference and, where possible, we will assist. For all cursive fonts we will use cut around /contoured acrylic backing as shown in Option 1. For non cursive/basic fonts we will use a rectangle acrylic backing as shown in Option 2. If you have a preference on what backing is used please let us know during checkout. Our backing acrylic comes clear as standard however we can provide colored backboards including Black, White, Metallic Silver and Gold. If you have something in mind please ask us. Do I need a remote / dimmer? Our dimmers and remotes retail for $25. The remote offers a range of brightness settings, ON & OFF option, and Party Modes which makes the light sign flash, flicker and pulse. We recommend purchasing the dimmer and remote as it allows you to dim the neon brightness which can help with exposure when taking photos in front of new neon sign or having the neon light as a feature for a photo shoot or wedding. What are the small marks on my sign? Because Custom Neon™ light signs are handmade there are sometimes small marks on the acrylic or glue marks where the PVC tube holding flexible LED the has been attached to the acrylic. In the rare instance that the marks are evident they are always minor and not visible when the sign is turned on. Can I use my new light sign outdoors? Our standard LED neon signs are indoor signs but they are perfectly fine to use outdoors at events, parties, etc... provided they do not get wet. Our standard signs are not watertight and cannot be exposed to wet weather. We can create beautiful outdoor neon signs on request. Please contact us with your requirements. Please note that outdoor signs often feature visible seal marks where the neon has been waterproofed – these are clear and can only be seen when the neon is switched off. What other types of signs can you do? We can create indoor and outdoor neon signs, neon business signs, open signs, LED neon lights for home décor, neon wall art, weddings, birthdays, events, and more. We also offer UV printing to complement your neon sign! What if I want a sign that is only partially neon? You’ve come to the right place, Custom Neon also offers UV printing, so we can help you with a combination of UV printing and lightweight LED neon! USA - We have three flat rate charges for the USA depending on the size of the sign you are buying. Shipping costs are added at checkout. Australia - please use our Australian website to order. Rest of the world - shipping costs are added at checkout and are calculated according to your country and city. Standard orders take 3-5 weeks, including shipping. Express orders take 2-3 weeks, including shipping. All of our LED neon light signs are handmade. The above lead-times include both the production and delivery of your sign. Please choose your preferred shipping option at checkout. For Express orders, please let us know the date that you need your neon to arrive by in the comments section during check out. Why is the turnaround 3-5 weeks for standard order? Custom Neon™ signs are handmade so there is production time on each order. 5 weeks is the maximum turnaround time and most customers receive their Custom Neon order quicker. If you’re in a hurry please consider choosing the Express option. For express orders we aim to produce and deliver your order within 3 weeks. If we are unable to deliver your order within 3 weeks we are happy to refund the difference between the Standard and Express shipping cost. If your sign is faulty Custom Neon will cover the cost of return shipping. If you have changed your mind return shipping is not covered and will be at the cost of the customer. Please contact us to organize a return. * Store products do not include any personalized or customized signs, lights, lamps, wall art or other items. Customized and personalized items are not eligible for returns or refunds. Does my new sign come with a warranty? Custom Neon indoor products include a 1 year warranty which covers electrical components when used appropriately. Custom Neon outdoor products include a 3 month warranty which covers electricity components when used appropriately. Resolution for faulty signs will be dependent on the source of the fault and will be determined between Custom Neon and the purchaser. Custom Neon will either fix, replace or refund the product. If you still have questions we're happy to help. Just give us a shout and tell us what you need. We look forward to hearing from you.